Like a lot of things in life, the road to building my dream ZN6 started with a oops. What seemed like a real dissapointment at the time, actually turned out to be the trigger and motivation to create something that otherwise I probably would not have. 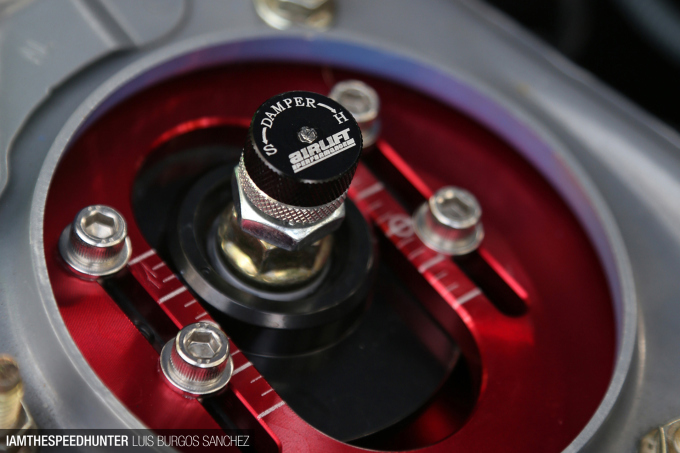 It’s been an exciting journey to get to where I am right now, so I thought I’d share the story with you in this I Am The Speedhunter post. I can still remember the day I headed along to my local go-kart track in Puerto Rico where a drift day was happening. Without knowing anyone, I introduced myself to a couple of drifters that were changing some tires. 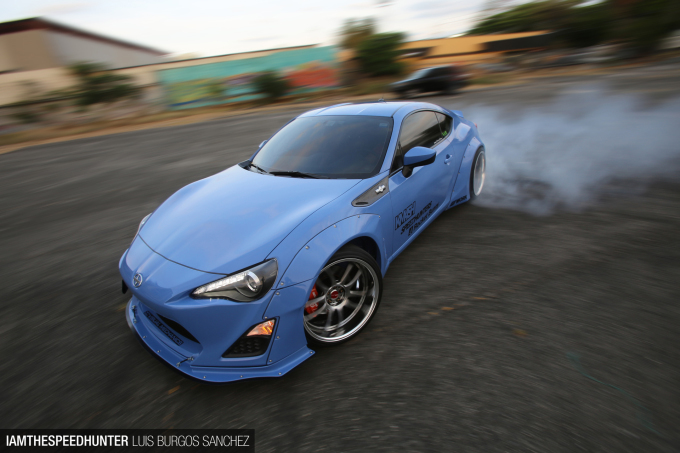 When they saw what I was driving – a recently acquired 2013 Scion FR-S (ZN6 US-spec) – all of them encouraged me to get it onto the track, and gave me some tips on how to start learning. That day changed my life and opened my eyes to a new passion: drifting. Drift in Puerto Rico is a growing. It’s come such a long way in a relatively short time and we now even have the PR Pro Drift Series, which helps local drivers qualify for the Formula D Series in the US. But a few years back, it was a small community only just getting organized. The camaraderie was – and still is – extraordinary; everyone supports and helps each other, and this family feel was something that really drew me towards the sport. So I decided to learn about the drifting and what was needed to optimize the performance of my ZN6. The more I asked questions and the more I investigated, the more I fell in love with the culture. Less than a year later I was into it, and I haven’t looked back since. As I became more experienced as a driver, I started feeling the need to extract more power out of my naturally aspirated boxer engine. Having some experience in turbo setups, I started looking into how I could boost the high compression engine without blowing it up. Eventually the day came when I had collected all the required components, and the rebuild began. I had two things that I wanted to achieve with this phase of the build: durability and performance. Using quality components is a big part of that, so we went with a Precision Turbo/Garrett GT35R with a .63ar exhaust housing to spool it up fast, and a TiAL 38mm wastegate to regulate boost. 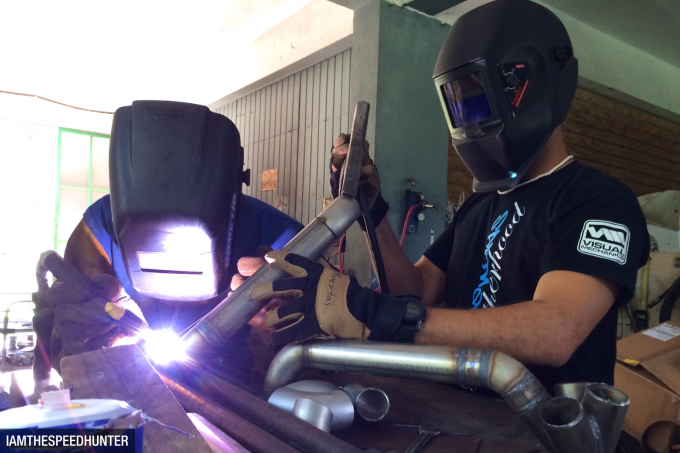 Since I’m fan of the Subaru boxer rumble, I asked a friend to help me build a custom stainless steel UEL turbo header and 3-inch downpipe that would connect to my existing 3 inch cat-back exhaust. The wastegate has been strategically positioned for easy access in case the spring needs to be changed to increase or decrease the boost range. 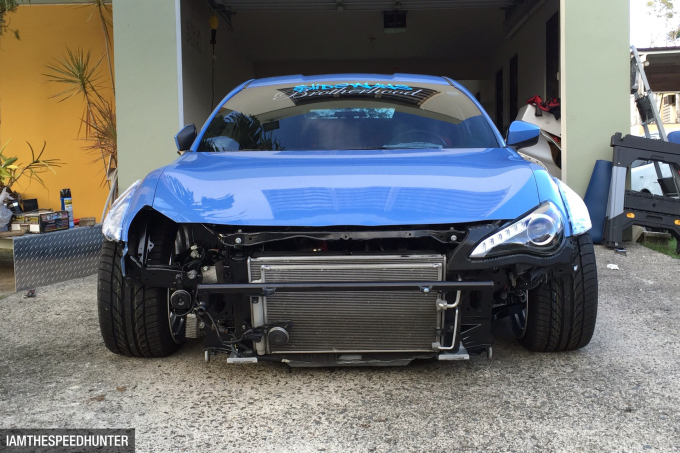 For me, there’s nothing sexier than a ZN6 with a well-positioned and sized front-mount intercooler. They add character to the front of the car and get rid of that nasty looking OEM grille. 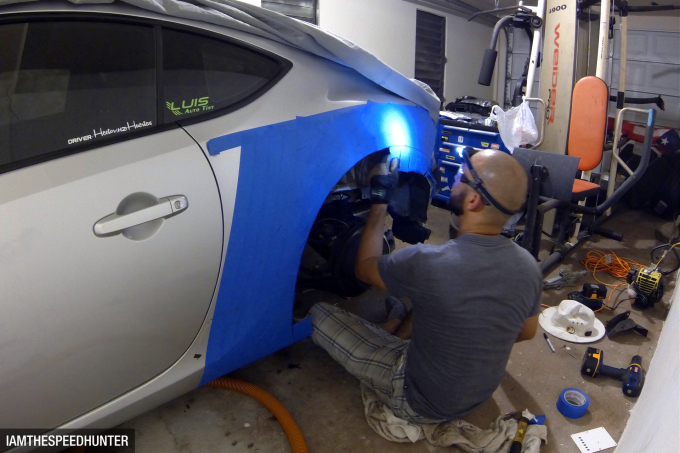 For my car, we built a custom chromoly front bumper bar so we could position the intercooler the way I wanted. After a month or so we had the turbo kit built and installed. If you’ve ever done an engine rebuild, you’ll know the feeling of accomplishment that comes with the very first start up. It was at that moment that I finally understood the saying ‘built not bought’. With all the modifications made to a stock engine, I knew that tuning was critical for its life and longevity, and after research I found one of the best tuners on the island. It took me a while to save up the budget for it, but I was determined to leave the ZN6 in the hands of an experienced tuner, so it was worth the wait. The final thing on my list was ensuring the power being made was getting to the wheels. 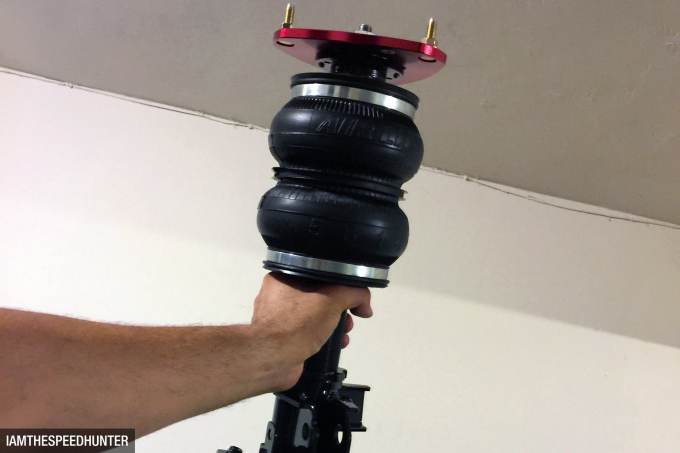 I knew the OEM clutch was not going to cut it, so with the help of another friend, we upgraded the car with an ACT 6-puck clutch and 10lb flywheel for fast revving and firm grip. Around a year after I had started the rebuild, we finally had the ZN6 ready to slay tires once again. The first day at the track with the new turbo setup still stands out to me. 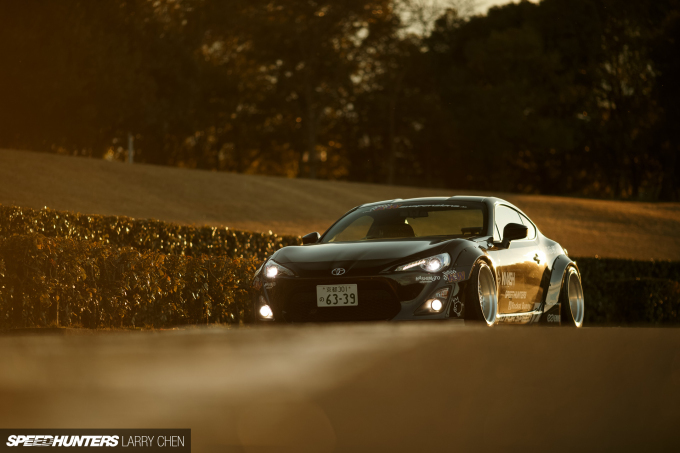 While I was enjoying my ZN6, I discovered that Speedhunters was releasing the KM4SH body kit. I had fallen in love with it the moment I saw Kei Miura’s first prototype; the kit was simple yet aggressive, and its uniqueness coupled with the way it transformed the chassis captivated me. It was nothing more than a dream though; I never thought I’d actually get one on my car. So what happened? Well, not long after, during a regular drift day with my friends, I got a little too confident with my driving. I wanted to do what Tuerck, Forsberg, Gittin Jr. and Denofa do when they run a ‘train’, but it didn’t go so well. It was one of those moments when I should have stopped, but decided to do ‘one more’, and in the middle of a run I ran out of tires on a turn, spun and was hit. At the time I didn’t care. It was part of the game; build it, crash it, rebuild it. Since I now had to do some repair work to the body of the car, I decided to go and make the KM4SH dream a reality. Whatever it was going to take and however long I’d need to wait was irrelevant; I was determined to do it. I got in contact with Keith Charvonia, who gave me all the info that I needed and some pointers in how to install the kit, and then I made my order. Much sooner than I expected, a big box was delivered to my front door directly from Miura-san’s shop in Japan. If you’ve received a parts delivery like this for your car before, you’ll know just how exciting it is. I still couldn’t believe that this was really going to happen, but I wasted no time getting to work. 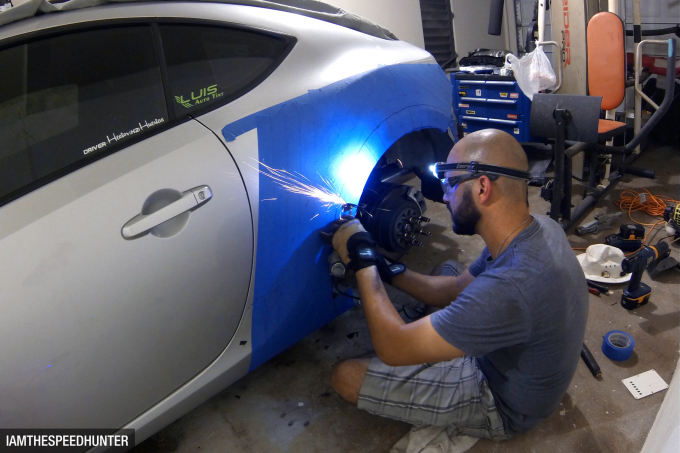 I am no auto body worker, but I realized that if the car had to be cut to fit the rear over-fenders, it was going to be me who had the enjoyment. This way I could install them the way I wanted, and if something went wrong I would only have myself to blame. So I took my Dremel tool and some painter’s tape, and after positioning and measuring at least three times, I made the first cut. It was the point of no return. Every day after work I did some more cutting and grinding, and in total it took me about three months to fit the entire kit. 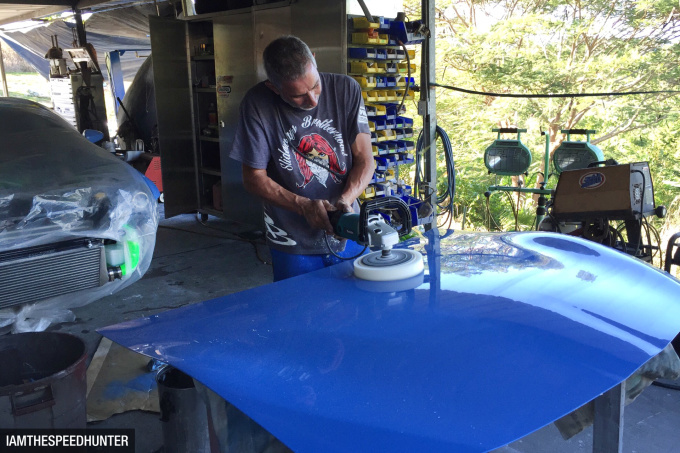 Now I was ready for a real body shop to take care of the final details, so I got in contact with one of my best friend’s father, El Flaco, who has a workshop in his garage. Since the whole car had to be repainted, I took the opportunity to change the color completely. My choice: Yas Marina Blue, as found on the new BMW M3 and M4. Right from the beginning I had an idea in mind for how I wanted the car to sit: deep dish wheels, low stance, fine fitment, but drift capable. There was only one way I was going to achieve all those things though, and that was by using air suspension. After doing a lot of research, there was no doubt in my mind that a Performance Series kit from Air Lift Performance was the way to go. 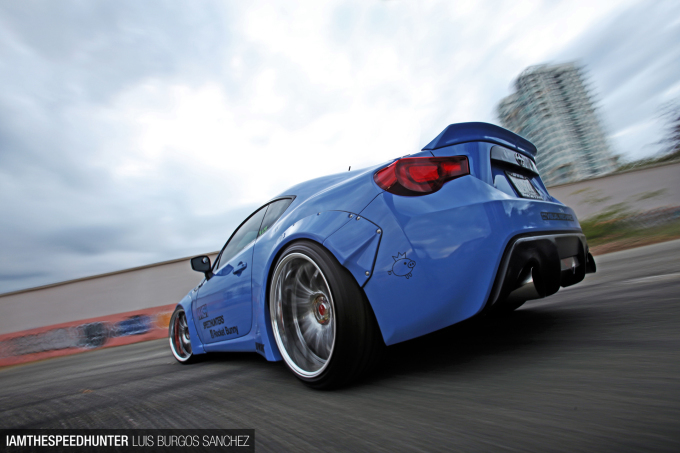 It would give me the all versatility I wanted; I could go sideways on the track and then drive in the hilly and bumpy roads of Puerto Rico, making changes in height with a touch of a button. Since the car was going to be dropped by a couple of inches, I added aftermarket toe and lower control arms so I could adjust the rear camber to -1 degrees at my new normal (low) ride height. The front suspension was set up with some aggressive negative camber as all good drift cars have. As soon as the car had come out of the body shop I had to make a decision on the wheels. 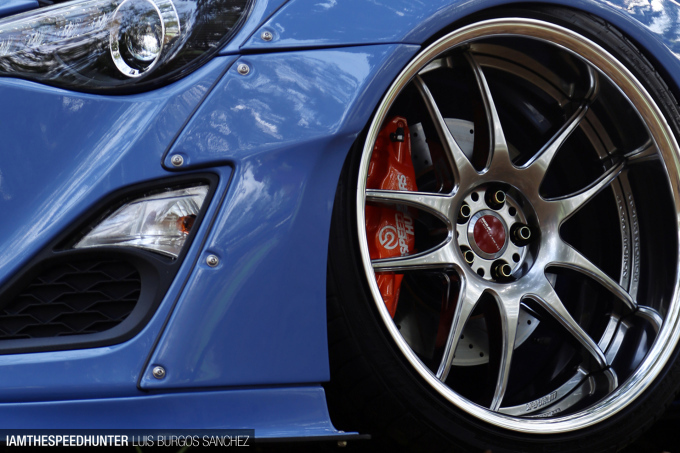 I’ve always been fan of Work Wheels, and as soon as I saw the Emotion CR2P, I knew it was the style I was looking for. Because they are custom made to order, the tricky thing was choosing the size and offset. I measured so many times before finally sending through the order, and when they finally turned up I was so relieved to see that I had got my measurements right. I wasted no time getting tires on the wheels – one of my sponsors coming through with a set of Achilles Radial AT2s – and soon had the car sitting on the ground. The only thing required then was a little bit of shaving to get them fitting perfectly. So we finally did it. I say ‘we’, because even though it was my garage project, I wouldn’t have been able to complete it without the support of my family and friends – those who shared sweat, grease, blood and beers throughout the reform of the car. Now I use my ZN6 as a tool to help others, to encourage them to not give up and show that great things come when you have determination and make sacrifices. I can’t say that my car is complete – there is still a lot of room for improvement. It is often said that a car is the reflection of its owner’s personality, so I still have a lot to improve and to learn. It’s a constant evolution. Nardi steering wheel, Works Bell hub, AEM Failsafe wideband/boost gauge. what happened to the K20 KM4SH Golf? This is great story Luis! Thanks for sharing. Nice, love the wheels. Good colour choice too! The article may have needed some proof-reading before posting, but beautiful car indeed . Cool story, keep it up! I have to say... 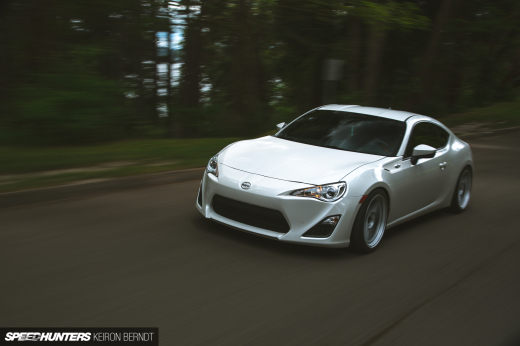 This is one of the best Scion FR-S(GT86) I have ever seen around the Island. 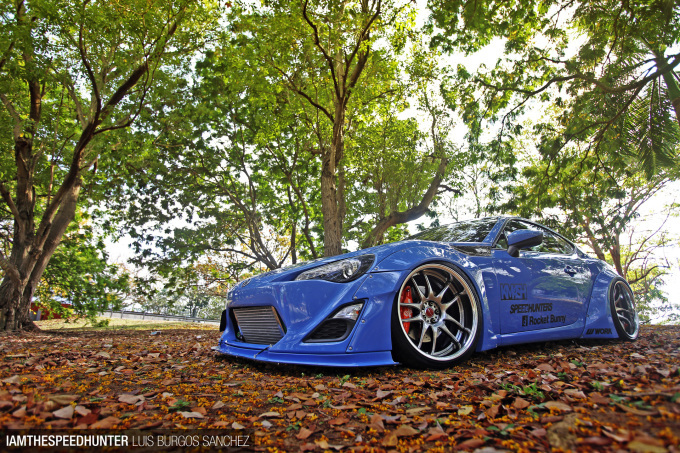 Awesome work Hector and thanks for share your build here on Speedhunters! Finally, a developed and built 4U-GSE!!!! I hate all non boxer swaps in this car. 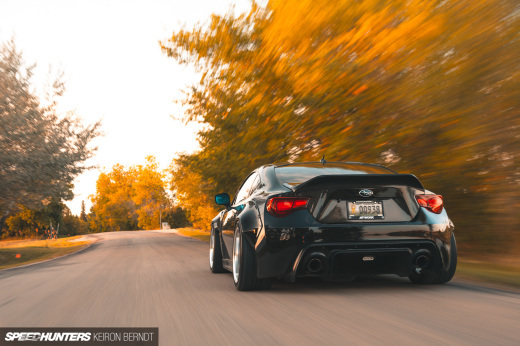 I was recently wondering if the KM4SH bodykit only exists on Kei Miura's black demo car, Keith Charvonia's old road car and the Scion Tuner Challenge IMSA-inspired FR-S. And finally now I see another ToyoBaru using this kit, one that's built to be driven hard as well! jay8393 There are a handful of us. It's a very small community. Beautiful car man. 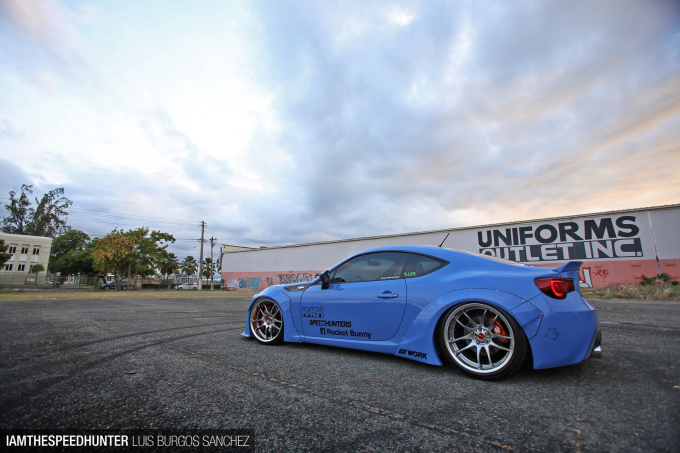 Perfect stance and love the choice of color and kit. My favorite part - that forward angled intercooler. So right. "Precision Turbo/Garrett GT35R turbocharger" - Precision and Garrett are 2 different turbo manufacturers, right? Very nice car and build! 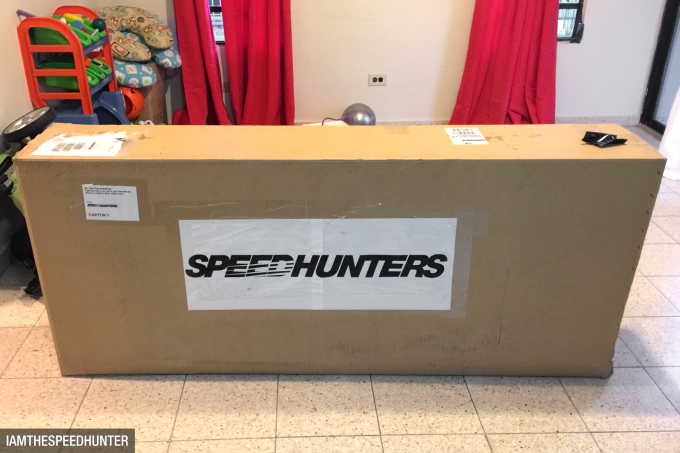 @sam123 Seems as if whoever was building it got a bunch of parts and work paid for by speedhunters/sponsorship and then quit. Nice one. 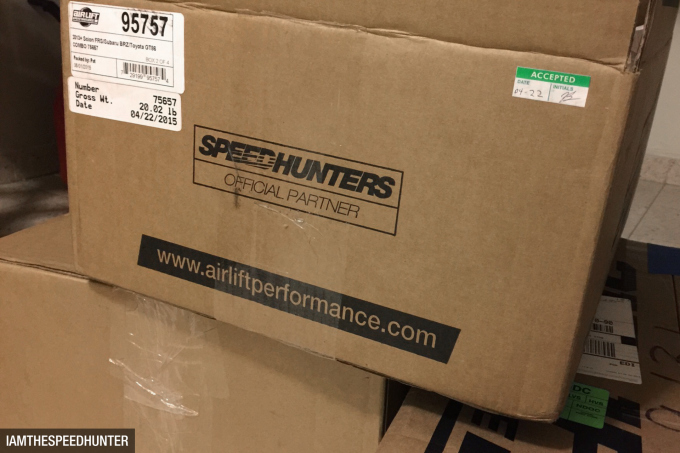 None of the staff involved in that project seem to work for the speedhunters "team" any more. LOL. I know what you mean!! huertash What is the combination? If Garrett makes the CHRA, Does precision make both the impeller and turbine? Does the CHRA have both oil and water lines? Ceramic ball bearing? We use a GarrettGT3582R .82 AR with a Forced Performance impeller and SS turbine housing. The Garrett Ball bearing CHRA has both water and oil lines. I am curious about different CHRAs and their pros and cons for road racing. For what I understand impeller and turbine are Garrett. Precision adapted the .63 ar exhaust housing and .70 compressor housing. Yes. It has water and oil lines and is ceramic ball bearing. Haven't had any problems on the road so far.